"Our latest innovation was designed for the needs of home bakers and cooks who want to explore new recipes with more flavors for more people," said Ken Wilkes, CEO of Corelle Brands. "Pyrex Deep bakeware is all about bringing more people together. So instead of just inviting the neighbors, why not invite the whole neighborhood?" Christina Tosi – pastry chef, founder and owner of Milk Bar and Pyrex collaborator – was inspired by Pyrex Deep to bring together two of her all-time favorite recipes to make bigger, better creations. Her Cornbake 8-Layer Dip combines a sweet and savory cornbake base topped with a seven-layer Mexican-style dip. Tosi describes it as combining the best of both worlds to make a new flavor experience. Tosi, who is known for displaying the outer layers of her cakes, also loves the visual aspect that pure Pyrex glass bakeware brings to the culinary experience. Her Strawberry Lemon Cake beautifully showcases vanilla cake, lemon cheesecake, her signature milk crumbs and pickled strawberry jam and frosting for a colorful sweet treat. "I want to show the world all of those layers of flavor and texture," said Tosi. "That's why I love Pyrex Deep bakeware – you can have more fun experimenting in the kitchen and really make your creations stand out!" From savory casseroles to decadent desserts, Pyrex Deep bakeware not only inspires creativity in the kitchen, but also reduces spillover in the oven. 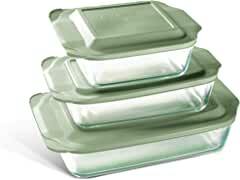 Pyrex Deep bakeware is available in three sizes – 9"x13" ($18), 8"x8" ($14) and 7"x11" ($16) – and comes with a fitted lid for easy transport and storage.